After being in business for 70 years, we know a thing or two about flowers. 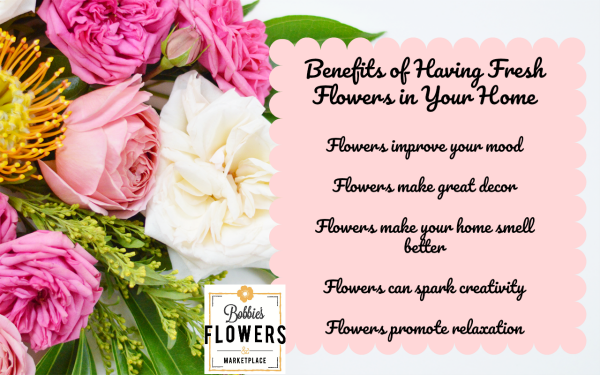 We’ve come up with a list of the benefits of having fresh flowers in your home. Flowers make great decor. With the variety of arrangements we make, we can enhance any style you prefer in your home. Flowers make your home smell better. Who doesn’t love the smell of fresh roses, peonies or lilacs? We sure do! Flowers can spark creativity. If you work from home, isn’t that a significant benefit? Flowers promote relaxation. Drop flower petals into the bath too and take your relaxation to the limit! We realize there are many more reasons than we’ve listed and we would love to hear your ideas, so please leave us a comment!